Bouquet Of Roses by Eddy Arnold dominates the folk (country) music scene all summer, first hitting #1 on the folk music sales charts in June 1948 and topping them for the last time in mid-February, 1949! The 54 total weeks it spent on the charts was a record that went unbroken for 62 years. Though that was his biggest hit it was merely one of 147 hits Eddy Arnold scored over the course of his career as one of country music’s most dominant performers. Arnold had gotten his start in the 1930’s on radio, as it was common practice at the time for musicians to host local shows, spinning records as well as performing their own material, and his exposure over the airwaves led to his first appearance on the Grand Ol’ Opry in 1943 though he had yet to make a recording. Upon signing with major label RCA however his career took off as after an unsuccessful debut single in 1945 his next 57 releases went to the Top Ten, not missing again until 1954, a run of consistency that is hard to fathom. During this time he continued working on radio, then added television to his résumé in the 1950’s, in the process doing as much as any performer to broaden the reach of what had previously been seen as a regional style of music with appeal relegated to a poor rural audience. In his career Arnold sold more than 85 million records and those 147 hits place him second all time in the country field. 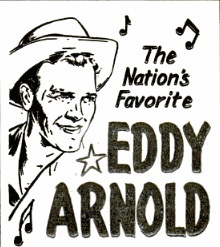 In 1947-48 at the peak of his popularity Eddy Arnold held down the #1 spot on the charts for a full year without interruption, November 15, 1947 through November 13, 1948 (on the Best Seller list… he held down #1 on the Jukebox listings even longer, until November 27th). No artist in any field on any chart has ever come remotely close to matching it. 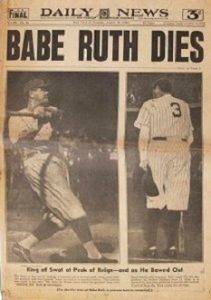 Baseball legend Babe Ruth dies of cancer at 53. The colorful orphan had been one of the best left-handed pitchers in baseball during the latter half of the 1910’s with the Boston Red Sox but his prodigious power hitting soon took him off the mound and made him an everyday player. He was sold to New York and subsequently transformed the game, ushering in the “live ball era”, setting records that seemed more fantastical than factual, kick-starting the Yankee dynasty and becoming the most popular athlete of all-time. In 1946 he’d contracted a rare form of cancer (nasopharyngeal carcinoma) and became the first ever human patient to be treated with the then-experimental chemotherapy. He seemed to be recovering after the initial rounds but soon his condition got worse and he succumbed to the disease on August 16th, 1948. Hundreds of thousands of people waited in line in the rain at Yankee Stadium (known eternally as “The House That Ruth Built“) to file past his body laying in state and pay their last respects. 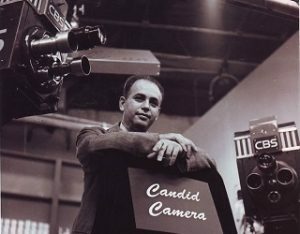 Candid Camera makes its debut on television under the title Candid Microphone, a carryover from the previous year when it was on radio. It was one of the first programs to take advantage of the camera itself as a prop in the new medium, albeit a hidden camera, to capture people unaware they were being set up for a joke the viewing audience was fully aware of. When the gag was completed the victim would be told “Smile! You’re on Candid Camera!”, which became a catchphrase for years. Despite the rather flimsy concept, because there was no limit to the situations that could be created the program has been a staple on American television ever since, alternating between networks and syndicated runs, and more recently on cable. For most the its life the show was hosted by its creator from the radio days, Allen Funt, then in 1986 he was joined by his son Peter who took over permanently after his father’s 1993 stroke. During a four year stretch in the early 1960’s it placed in the Top Ten each season. 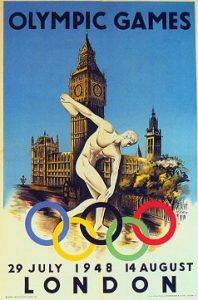 America dominates the Summer Olympics held in London, England, as competitors from the state of California alone win more medals than all but three other entire countries. The 14th Olympiad’s most notable stars included Bob Mathias, a 17 year old from California who’d just graduated high school two months earlier, who won the decathlon, a sport he’d only first tried that same year! Meanwhile a 30 year old housewife from Holland, Fanny Blankers-Koen, was the top individual performer for the entire games, winning four gold medals in the 100 and 200 meters, the 80m hurdles and the relay, earning the mother of two the nickname “The Flying Housewife”. Across America the annual Telephone Directories are issued to residents. 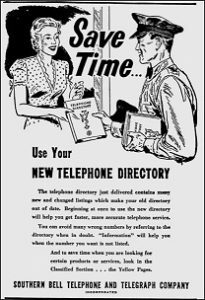 Along with providing the phone numbers of everybody in your town they offer helpful tips on how to use your telephone, which was still not in every household nationwide. Among the recommendations are: Be Certain To Hang Up Carefully. Banging the telephone when you hang up may give the person on the other end an unpleasant bang in the ear. It may also cause the telephone to go out of order. Now that’s what you call good advice. 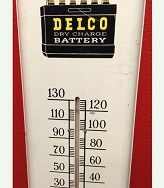 Just five months after setting a record for lowest recorded temperature (-5 F) in the month of March, Cleveland sets a record when the mercury hits a sweltering 102 F, the hottest temperature ever reached in the city. Meanwhile an estimated 87% of those reading this in the 21st century instinctively thought “global warming!”. 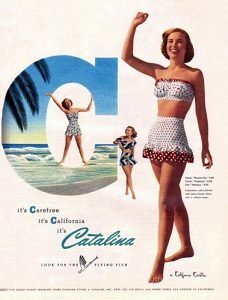 If the heat has got you down, though summer is nearer the end than the beginning, there may still be time to shop for a Catalina swimsuit, retailing for just $8.00. If you’re in Cleveland though keep in mind it’s a long way to the ocean.